Qatar government has implemented major infrastructure and construction projects in its financial budget in 2017, these initiatives had a positive impact on the economic growth of the country which has resulted in achieving an overall GDP growth rate of 2.1% in 2017, the highest in the GCC region. Additionally, population in Qatar grew at a rapid pace over the past few years resulting in construction of several residential societies and expansion of public & private infrastructures in the retail, transportation, entertainment & leisure, and hospitality sectors. 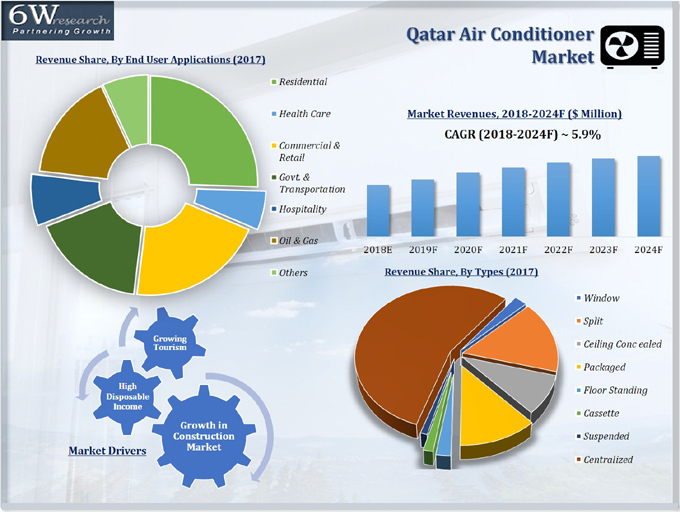 According to 6Wresearch, Qatar air conditioner market is forecast to grow at a CAGR of 5.9% during the period 2018-24. Construction industry in Qatar is expected to boom with government planning to spend around 47% of the national budget on major infrastructure projects, thereby attracting foreign direct investment in the country. Further, the government is planning to develop nation's higher education capabilities and is expected to construct new schools with a total cost of around $1.9 billion across the country over the coming years. Development of world class infrastructure for upcoming FIFA World Cup 2022, Qatar government has planned to invest more than $200 billion over the coming years. Further, construction of centrally air-cooled stadiums and auditoriums are anticipated to spur the market for air conditioners in the country. The residential, commercial and retail applications garnered maximum revenue share from air conditioner sales due to growth in residential construction projects in the region. The report thoroughly covers the air conditioner market by types, applications, and regions. The report provides an unbiased and detailed analysis of the on-going trends, opportunities/high growth areas and market drivers which would help the stakeholders to decide and align their market strategies according to the current and future market dynamics. 19.3. GREE Electric Appliances Inc.